not yet consistent with limiting warming below 2oC unless other countries make much deeper reductions and comparably greater effort. Nevertheless this is better than most countries have managed. Interestingly, the only countries to exceed a medium rating are these. I don’t think they will save the planet on their own! So we can calculate that the Conditional Reduction of 36% would leave emissions at 710 MtCO2e in 2030. While health and environmental benefits of such reductions would be immediate and clear, the effects on global warming are likely to be close to zero, not additional and extremely uncertain, as opposed to the effects of reductions in greenhouse gas emissions. Nowhere does the INDC give any numbers for current or historical CO2 equivalent emissions, but we do know what it was in 2005, thanks to the GLOBE Climate Legislation Study, published last year. Including LULUCF, as the 2030 targets do, the figure for 2005 was 712 MtCO2e, effectively the same as the Conditional Target for 2030 of 712 MtCO2e. 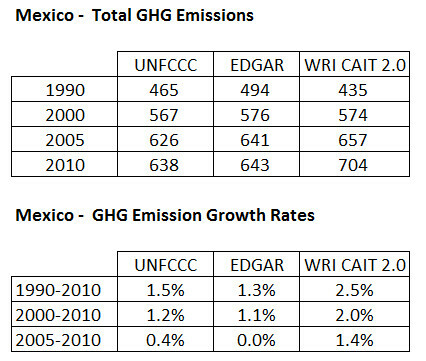 According to CDIAC, fossil fuel emissions have barely altered since 2005, up by just 7%, so Mexico’s plan is pretty much “as you were”. I think the plan is to export 36% of their population to the US over the next 15 years. Could I chip in with some alternative figures? Unlike the case for Indonesia, the various data sets are much more consistent, but can lead to slightly different conclusions. Compared to your 712 MtCO2e, they are as follows. The data sets are the “official” UNFCCC, EDGAR and the World Resources Institute CAIT 2.0. As can be seen (and as you assume), in recent years the emissions growth has slowed to near zero. Using the UNFCCC data the BAU scenario assumes an average 2.8% emissions growth from 2010 to 2030, made up of about 3.6% average growth for 2010 to 2020 and 2.0% average growth for 2020 to 2030. Using the UNFCCC figures still assumes an 11% emissions growth for 2010 to 2030 (average growth rate 0.5%) even after the 36% emissions “cut”. However, Mexico has a bit more “negotiating room”. The 36% cut is conditional on certain agreements being in place. The unconditional offer is only 25% to 833 MtCO2e. That implies a 1.33% growth from 2010 to 2030. Like with Indonesia, the conditional offer is achievable without effort, so “concessions” can be achieved at the last minute to reach an agreement. Like many others Mexico is paying lip service, hoping that lots of money will come their way. If it doesn’t you won’t hear anymore about these plans (except the squeals from the UN).